The queue for the ferry to the island of Hvar found the van parked next to an icecream café, a good way to while away the minutes to departure. As we boarded the boat though, there was a last minute hitch – we’d apparently been sold the wrong ticket. Although the girl at the ticket office had seen the van in its entirety, she had charged us too little. I made a mad dash back to the office and paid a bit more for the right ticket. Then we were off across the spangly sea to Hvar. The late afternoon light bringing out the best of the natural colours. The mainland mountain massif stretching like pale pink and navy crepe paper as far as you could see, the island of Brač to the north and the now distant Pelješac peninsula to the south. 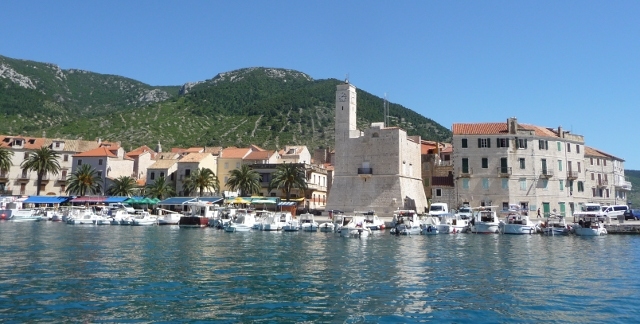 We arrived at the small port village of Sućuraj. As it was getting later in the day, we thought about heading to the first campsite on the island, but missed the turning. We drove a longer way than was worth turning round by the time we found somewhere to turn round. We decided to head onwards, most of what we wanted to see was at the western end of the island anyway. We were also enjoying the road too much as it wound and twisted up and along the ridge of the long narrow island with the sea on both sides. 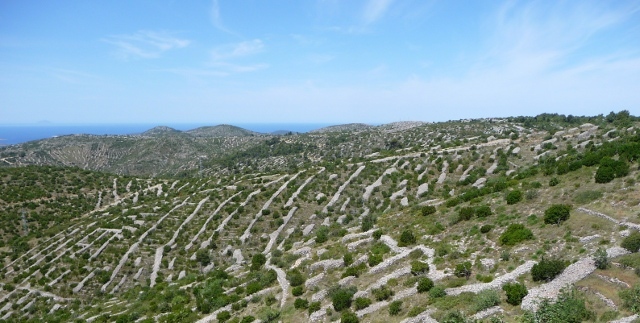 The terrain was largely Mediterranean maquis, but abandoned stone-walled fields of lavender, olive trees and vines are also a feature of the island. We drove on some 50 kilometres and gradually dropped down to the north coast and the small town of Jelsa followed soon after. We drove by three campsites, the middle one took our fancy immediately, with its pitches among pines sitting just off the road but above a rocky cove with a path down to the crystal water’s edge. Campers were busy cooking their meals and even tightrope walking, and yes, there was still space for us in the trees. We drove to the edge of the town before turning around, and it too was picture perfect, stone buildings with terracotta roofs clustered around a tiny harbour in an inlet. It would do at a pinch. Croatia is popular with naturists, many campsites are totally devoted to it, others have a naturist as well as a ‘textile’ section, and there are lots of beaches that are FKK, the term for nudism here. The rocks below us seemed to be semi-nudist, perhaps inherently so given their seclusion, and a young German couple had claimed one area for their own. We studiously ignored them, not given to such abandon ourselves, as we had our dip in the sea – Adrian swimming right across the small bay and back. We cycled into Jelsa and continued along the coastal track round further coves and inlets to Vrboska, a quieter village with pretty small bridges over a canal leading into its harbour, and an impressive fortified church. Over the centuries these island communities fell prey to piracy and raids from Turks, Saracens, Venetians, anyone who was passing it seemed, and fortified churches in a variety of styles are common. We cycled back to Jelsa and had a leisurely seafood lunch on the square, then back to our site to chill out and swim again. Our nudists still in position, their overall suntans slightly thwarted by the amount of factor 50 they seemed to be applying. We read about Humac, an abandoned village in the hills, in a local tourist leaflet and the pictures looked appealing. Up to now I have tended to avoid cycle rides involving hills, due to my low level of fitness. Something must have changed though because I did several kilometres of uphill, from sea level to more than 200 metres, virtually without stopping. The village was at 310 metres altitude though and when we finally got to the turn off towards it, we realised that the last 100 metres was pretty much straight up… I did walk a lot of that stretch, but Adrian cycled most of it. The weather helped, being slightly overcast with a light breeze and we felt very proud of ourselves. Although largely deserted, the village boasts a rustic Konoba or inn, which was open for big food and cold beers. There was a large party of locals partaking of a peka – a roast dinner cooked beneath a bell-shaped lid covered with embers. These have to be ordered in advance otherwise we would have immediately undone the benefits of our cycle ride in one fell swoop. We had food with us anyway, so after thoroughly enjoying our cold beers, accompanied by some wonderful singing from the lunch party, we headed off to explore the village. We found a picnic spot at a panoramic viewpoint with telescope in the middle of overgrown stonewalled fields. You could see for miles across the western end of the island, with Jelsa far below us in the distance and the other outlying islands serene beyond. Like so many places around the world, the old ways were not enough for younger generations and migration lead to desertion of the village. Luckily there are moves to preserve what’s there and festivals are still held from time to time. Among the grey stone dwellings and farm buildings, tools and trappings of the activities left behind, we came across an older man who explained some of this to us as he opened up one of the cottages and led us inside. The furniture and some kitchen items and other possessions remained, with the religious images over the bed still in place. The village was a seasonal settlement, and he had lived there as a child, and is one of the caretakers for it nowadays. He spoke about how many people who have moved away do come back for the festivals, how origins have become important again, as you just can’t get that sense of community in a city. See a mini collage from Humac images made as part of the Colourboration circles theme. The road back was blissfully downhill all the way back to Jelsa, and we had a welcome dip to cool off. And more cold beer. 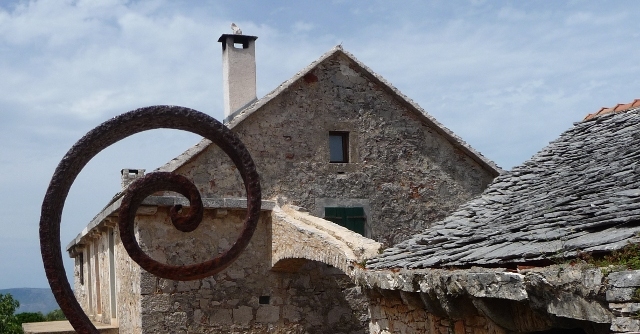 We still had a lot to see, so we moved on from Jelsa towards Hvar town. 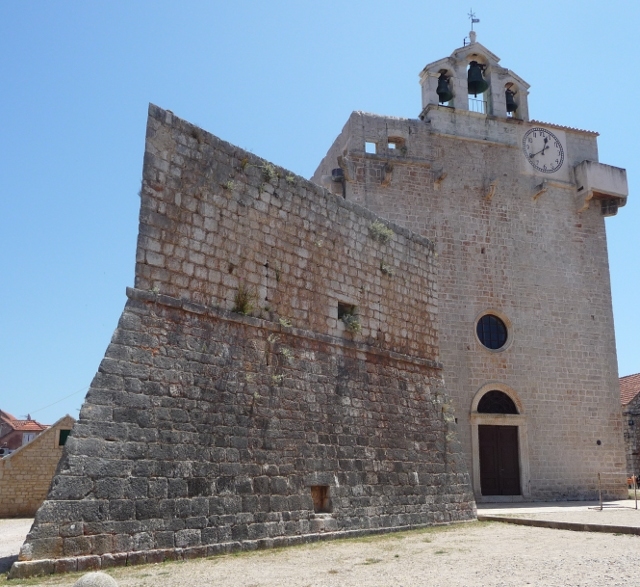 First we called in at Stari Grad, a bigger old town with a harbour, pretty Venetian influenced churches again in an inlet some way inland from the open sea. Its pretty old streets have big shiny cobbles, and we just made it in time to another must-see sight, that of Tvrdalj, the summer house built by 16th century poet and nobleman Petar Hektorović, before it closed for the long afternoon break. 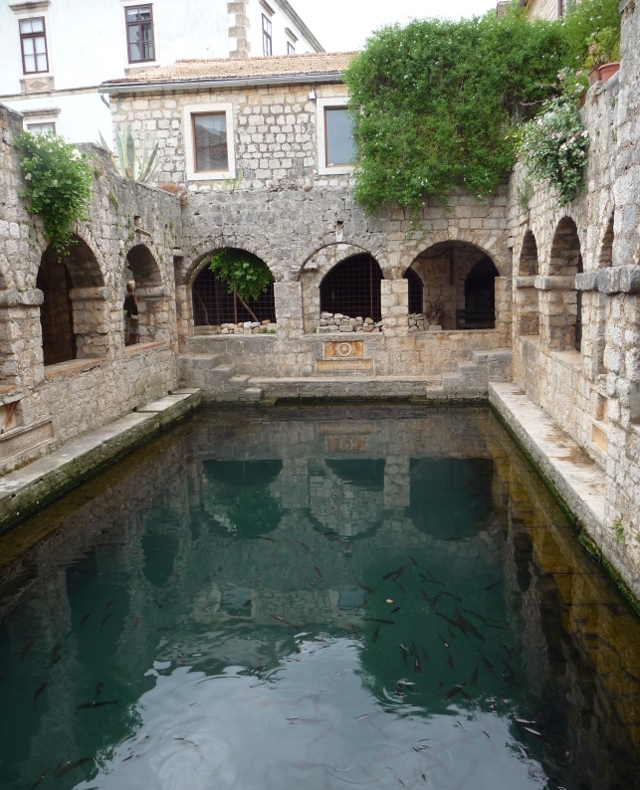 It is a tranquil old rambling building around a fish pond full of grey mullet. It has many epigraphs of Hektorović’s writings inset in the walls, and a garden running behind it. From Stari Grad we took the main road to Hvar town, through the hills in a tunnel, and then winding through more hills above the sea. We missed the turning for the first campsite we were going to check out and headed instead for one just the other side of the town, and almost checked in here. They sent us to look at pitches, which were graded A or B and overpriced accordingly. The A category seemed to cover everything from a waterfront location to a pitch up in the Gods, and they were all very small. The B zone spots were scrubby uneven sloping pitches with a loo view. People didn’t seem that friendly either. We emptied our waste water there and left deciding to take our chances with the first site we’d passed. It was the right decision. The Mala Milna site was at the edge of a small village, set between two coves, and right on the water. We had a warm welcome from the owner and chose a corner pitch overlooking the further cove, right at the edge among the wind twisted pines, with our table and chairs on a lower level. Idyllic. The path from village to the pebbly beach in the cove ran right through the site and there was a constant stream of bathers back and forth. All good people watching! And our German neighbours had a small boat moored down in the cove which the chap seemed to make heavy weather of using, rowing a dingy out to it several times a day, sometimes accompanied by their reluctant border collie. It was a 4km run into town, much hillage, but few buses. So it was onto the bikes again, our levels of fitness increasing daily now. 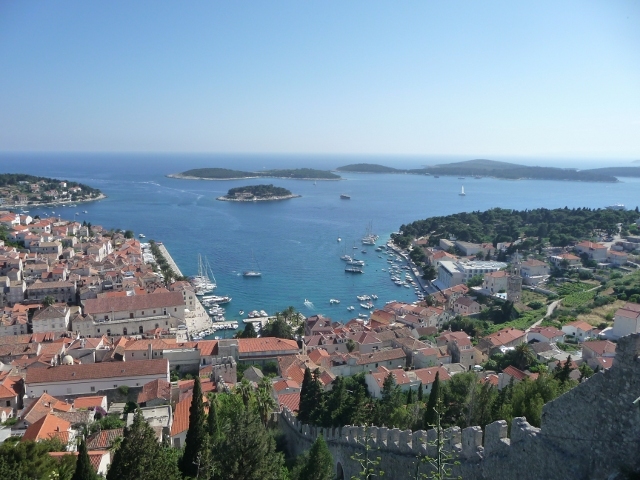 Hvar town is attractive, Venetian campaniles, churches and monasteries abound, narrow cobbled streets, and a fortress presiding over it all. It’s also very fashionable with the International jet-set flying or sailing in, huge yachts lined the harbour, and people from Prince Harry to Beyoncé make regular visits here. It has a swish feel but its stylish hotels, restaurants and classy boutiques don’t detract from the beauty of the town and its setting. Inevitably there were a couple of huge cruise ships moored out in the bay, and boats of all shapes and sizes, private and public were constantly in and out. We climbed up to the fortress, well worth the gradual ascent with the expected fabulous views out over the town and the islands. Vis is Croatia’s outermost Adriatic island and sounded appealing, not least as it gives access to the smaller island of Biševo which has a blue cave to rival that of Capri’s blue grotto. We knew we wouldn’t be able to take the van there, no campsites and expensive ferry fares, and there were no regularly scheduled ferries from Hvar, only from Split, necessitating at least one overnight on the island, and leaving the van at a campsite somewhere on the mainland. Then organising a trip to the cave on another island. It all sounded quite complicated and expensive. We came up with the perfect solution – you could do a tourist excursion to Vis which would take you to not one but three caves, and to visit towns on Vis too. There was a slow bigger boat, then for just a bit more money you could go on a speedboat trip, which would allow you to see and do more, with fast journey times from Hvar to the outlying islands, and there would only be up to six other people. It sounded perfect. It was perfect. The weather was wonderful as we clambered into the boat and astride the seats all facing forwards. We were off, gently purring through the waves out of the harbour, was that Beyoncé’s yacht? 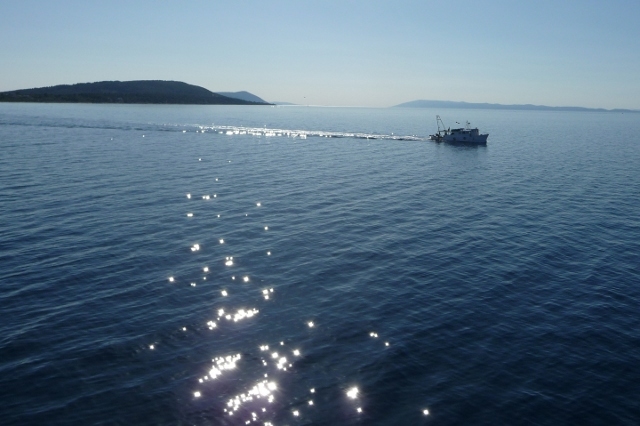 And past the Pakleni Islands that lie just off Hvar, we picked up speed and bounced along the sea, holding on tightly. Really quite fast. It was exhilarating, thrilling and rather scary at times. Especially as the waves got bigger and bigger and our craft felt tiny as it bumped and jarred between them or up and down them. Erm, this was safe wasn’t it? The captain told us where the life jackets were but we weren’t actually wearing them. Britons feared drowned in boat accident headlines came to mind. We went first to the Green Cave on the Vis coast, so called from the algae that colour the water and walls of the cave. After this we went to a cove almost enclosed by rock around it, here we stopped for a swim from the boat. The water was quite chilly and it was quite busy there with people from a couple of bigger tourist boats also enjoying the ‘seclusion’! We started to get to know our fellow passengers, Chris and Lana from the States who are currently living in Serbia, Dave and Lauren from Yorkshire, and Mathilde and Celine from France. With such an intimate trip where you are spending the whole day in close proximity and fellow passengers have to help eachother get in and out of a very small boat from the water (forget about dignity), it could be make or break if they were unfriendly. We struck very lucky – we had a really great bunch. After our swim at the cove, we stuck close to the coast, looking at remarkable rock formations, semi-caves, natural bridges while the sea surged all around. The geometric strata of the rock gave the optical illusion that the sea was leaning, a very odd feeling. Vis was for a long time a military zone forbidden to foreign visitors and it is fairly new to tourism. You can see the remnants of secret tunnels into the rock faces, with bunkers dotted here and there too. 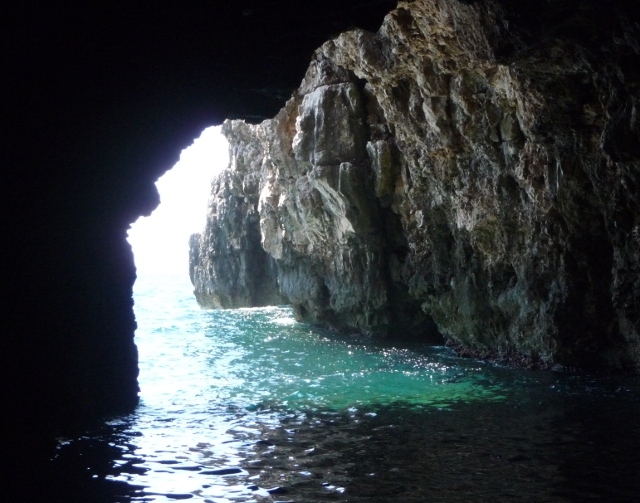 We knew that a visit to the Blue Cave would only be possible if the sea was really calm and it was looking doubtful. Our captain juggled the various visits to push the Blue Cave a little later as he had heard the sea might be calmer then. So we spent some time at another beach and had a beer together, before we got back in the boat and went first to Monk Seal Cave. This was more impressive than Green Cave, and after a boat tour inside, the captain offered us the chance to swim into it. The sea still appeared to be quite vehement, but you can’t turn down the opportunity to swim into a cave. Especially with the thought that the Blue Cave might be closed. So most of us were back in the water getting quite a workout swimming into the cave. It was wonderful, but also a relief to make it back to the boat across what for me was still a rough sea! 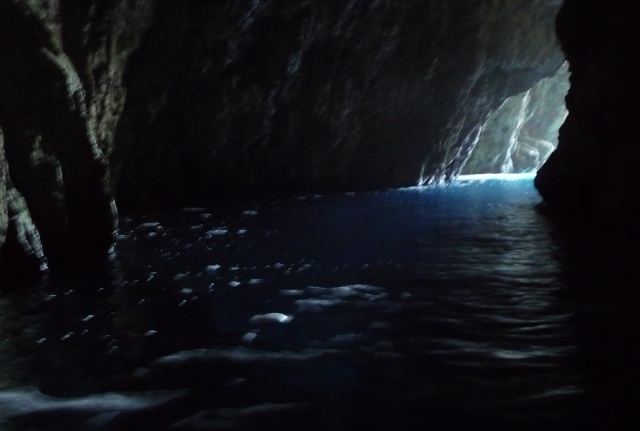 So then it was onto the Blue Cave on Biševo island a short distance away – again at speed! It was still choppy, but where was the cave? We drew up to a cliff face and could see nothing, and realised that the entrance to the cave is tiny. The sea was still quite high, too high for the boat to enter, but we could swim in. This is usually not allowed due to the volume of visitors and boats, but at that point we were the only boat in the vicinity. The captain went first to check that it was safe for us to enter, having anchored the boat and fastened it to a line that ran across the opening. We then eased ourselves into the water with great anticipation. We were going to see the Blue Cave, and what’s more we were swimming in. In through the low narrow entrance into a dark passageway with hints of blue flickering on the walls, after a few metres, the cavern opened up and you turned right into the chamber. There it was, intensely blue water, lit from a shaft of light somewhere somehow below it. Blue flickering blue curaçao water, and we were all swimming round and round in awe. It was an amazing experience. In a side chamber the sea was surging in and out and we went in there to feel the force as it lifted you up and then dropped you down again. Better than any fairground ride or expensive special effects. We spent a good long time in the cave treasuring the experience, drinking in the colour. We didn’t want it to end. The best pictures we’ve never taken! Swimming slowly back out and back onto the boat again, we were all so ecstatic. The captain had some difficulty retrieving the anchor. In the end he gave up and left it there, buying a new one at our next port of call, the town of Komiža on Vis. It is a beautiful place, with the light stone buildings of the region, a fortified church and wide harbour. We got to spend a couple of hours here, having a late lunch and a wander round the tranquil back streets, with multi-shuttered stone buildings and flowers everywhere. All too soon it was time to board our tiny but speedy vessel to head back to Hvar in the golden hazy early evening light alongside the west coast of Vis, its steep hillsides dipping right to the sea. It would have been nice to be able to spend longer here, exploring the island further, but we had had a wonderful day – one of the highpoints of the trip. We cut through a channel inbetween the Pakleni islands and then it was back into the harbour at Hvar, looking glorious and just starting the evening passegiata buzz. We were sad to say goodbye to our new friends, but it was time to head back for showers and dinner, local ham and fresh bread, and wine, back at our idyllic campsite in our own little cove. 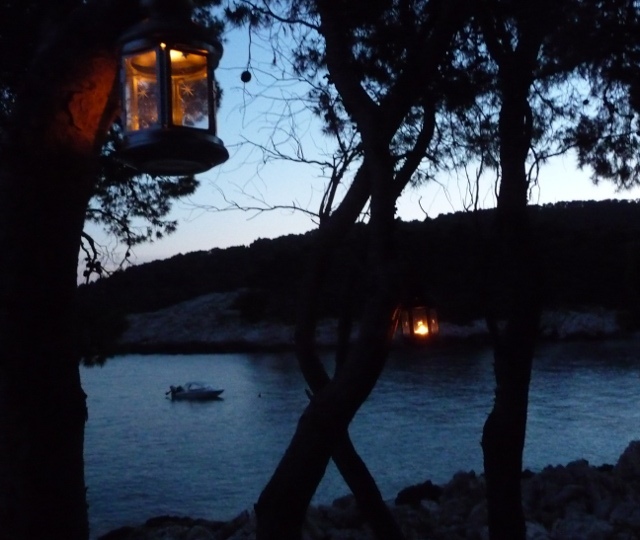 The next day after seven nights on Hvar, we decided reluctantly that it was time to move on. The ferry from Stari Grad to Split was too expensive an option so we drove back the way we’d come though took the narrow mountain road over the hills towards Stari Grad, rather than the faster road via the tunnel. The hills here feature characteristic stone walls in various formations, built over centuries as a way to clear the land of stones so that it could be cultivated. So much of the farming has now ceased but the walls still remain, a wonderful feature in themselves. Again as we climbed on to the ridge of the island, the views were stunning. The sea an impossible blue. 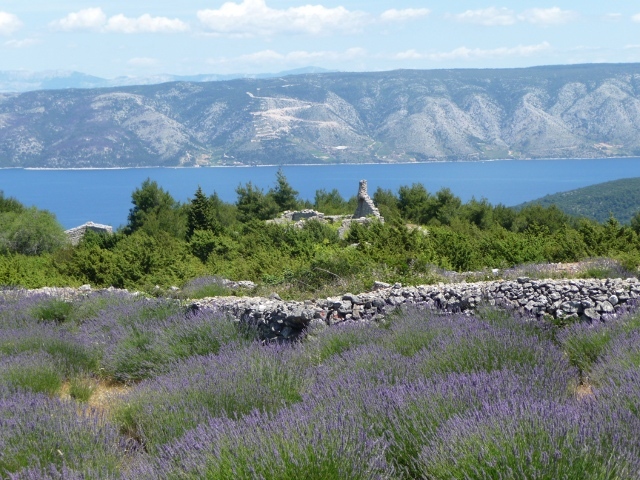 From Stari Grad, we passed the ancient stone walled fields which here date back to Greek times. We drove back the way we’d come via Jelsa and the road we’d cycled up to Humac. A couple of Italian ‘fridge freezer’ style campervans were coming the other way as we ascended. We stopped for them, the first one kept on coming even though he was well over onto our side of the road, possibly nervous of the sheer drop to his right. He broke our wing mirror. Both vans stopped and there was an altercation in which Adrian was ranted at, at length, in Italian. It couldn’t possibly be the Italian’s fault could it? Having survived Italian drivers unscathed for four months, we fall prey to them in Croatia. The driver refused to admit fault or to settle up, insisting on doing it through insurance. This would cost us more in the long run, so it wasn’t going to happen. No one was dead, it was only a mirror, but we’ll be inconvenienced and out of pocket, and the Italian driver gets away with it. This somewhat marred our last afternoon on the island, but we caught a ferry with five minutes to spare, and again we were charged too little by the ticket clerk. No one seemed to mind this time though, they were in too much of a hurry to cast off. And so we left Hvar. Reluctantly. 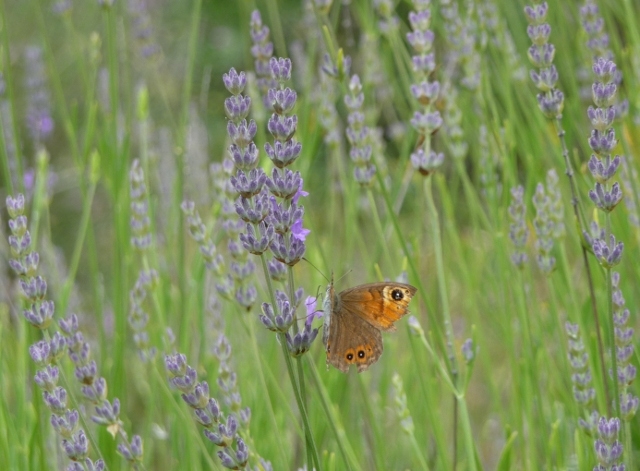 It had taken hold of our hearts and provided lots of new experiences, from chic towns to ancient stone walls, the scent of lavender everywhere and crystal seas, and some of the best days of the trip so far. This entry was posted in By Country - Croatia, Personal stuff, Travel stuff, Van stuff. Bookmark the permalink. Hello Ellie, I’m pleased to see you are on the road. I know it’s not a bookbus but I’m sure you have a few volumes tucked away where you should have stuffed some extra socks! Great to hear from you Ruth – hope all is well in Crafty land. We have indeed a few books tucked away although I haven’t read anywhere near my previous annual quota of them! We’ve had contact from a company who sell “Three Caves” boat trips from Hvar, saying that our description above can only be of one of their tours, that they’re the only reputable supplier of tours, and that by not naming them in this blog post, we’re pushing poor innocent tourists into the hands of the dodgy tour companies… They’ve sent us a link to the tour, and asked that we promote it here. Kindly, they’ve even provided a link to this page under the “reviews” section of their own site, obviously in anticipation of our endorsement.